Jenni Avins is the global lifestyle correspondent at Quartz, where she covers culture, lifestyle, and the burgeoning cannabis industry. She also writes the weekly email newsletter, Quartzy. Her work has appeared in New York Magazine, Wall Street Journal, VICE, Saveur, Gourmet, Harper's Bazaar, and Vogue.com. As a recent LA transplant, she's ever improving as a dinner party-host and surfer. If you see her back in New York, she's likely to be knitting on the subway. Pre-Piglet, I’d never been a person who kept one of those little memento booklets noting the menus and guests at a dinner party. Now, I am. Last night, we hosted a party that warranted the beginnings of such a record, utilizing recipes from both Nigella Lawson’s At My Table: A Celebration of Home Cooking and Alon Shaya’s Shaya: An Odyssey of Food, My Journey Back to Israel—both of which shall remain in my kitchen rotation. I’d already used recipes from Nigella’s book (we’re on a first-name basis, right?) on the nights leading up to the dinner party. They're midweek-cooking friendly, producing the kind of comforting food you can enjoy on the couch, watching Netflix. In the Tomato and Horseradish salad, a bracing horseradish dressing woke up some early spring cherry tomatoes; and sharp blue cheese with farmers’ market radicchio, walnuts (subbed, at Nigella’s suggestion, for chestnuts), and a citrusy dressing, in the Radicchio, Chestnut, and Blue Cheese Salad, showed up the veggie burgers we ate it with. My first impression of Shaya was perhaps less affectionate. 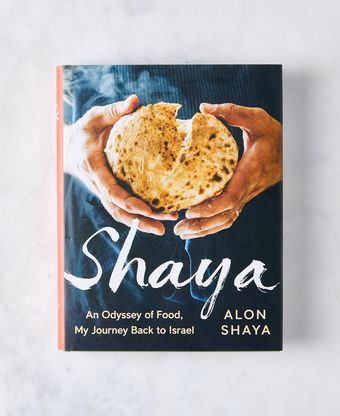 If At My Table feels like it’s really all about your table, Shaya, by New Orleans chef Alon Shaya, is clearly all about him. It’s a memoir-meets-cookbook, somewhat in the spirit of David Chang and Peter Meehan’s Momofuku. And like Momofuku, the recipes in Shaya require a bit of doing, by way of ingredient sourcing and prep. But the payoff is considerable, with recipes (and ingredients) that might change one’s cooking game forever. If I paged through At My Table, flagging dishes to make that very night, recipes from Shaya were reserved for the weekend. At My Table made me think: Maybe we don’t need takeout tonight. Shaya made me think: We’ll have to have a dinner party on Saturday. - I’ve used the same tzatziki recipe my whole life, which requires salting and “sweating” cucumber slices. This one calls for dicing the cucumber instead. It’s less fussy, and it’s better! - Though the introduction says Bulgarian yogurt is thinner and more sour than Greek, it doesn’t provide an idea for a substitute in case people can’t find it. I found it—along with many other ingredients for Shaya’s recipes—at the wonderful Tehran Market on Wilshire. If you live in L.A., this place is a gem. If you don’t, this book may inspire you to find a local Middle-Eastern market. - I never would have thought to cook these lamb chops in a cast-iron pan, and holy wow, they were amazing, with a perfect char and pink centers. I might never cook lamb chops on the grill again—or if I do, it’ll be with some cast-iron on top. - I love that she uses the word “squidge” to describe how to interact with your chops once they’re in the baggie with the marinade—and also that you only need to marinate for 30 to 40 minutes. Squidge! - I’d never made spanakopita before. It’s a multi-step process and a bit time-consuming, between cooking down the greens and cooling them, then cooking the onions and pine-nuts, then brushing each layer of phyllo with butter while assembling the pie. The instructions were crystal clear, but I would have loved a note estimating how long it would take. - This recipe calls for 2 full jalapeños—I only used half of one, and was happy. Otherwise, I followed the instructions. - It also calls for Bulgarian feta, which I found, again, at Tehran Market. The recipe (and book) does not say what distinguishes Bulgarian feta from regular, or what a solid substitute would be. - I delegated this to my husband, and we’ve since renamed the recipe “Beets by Corey.” He’s a less experienced cook but found the directions easy to follow. The results were delicious, and Corey says he’d make these again for a potluck. Luckily, we have leftover tahini dressing­—which has a solid amount of heat, thanks to the Aleppo pepper—in the fridge. - Speaking of Aleppo pepper, this was another ingredient I found at Tehran Market, but Shaya doesn’t say what distinguishes Aleppo pepper from other chile flakes, and doesn’t provide a substitute if Aleppo pepper is not available. - This is classic Nigella. It’s totally unfussy to prepare, and such a sensory joy to consume. The warm sauce soaked into the cake (she calls it a “sponge,” but mine wasn’t so fluffy), and this contrasted so well with the dollop of freshly whipped cream that goes on top. After the dishwasher was loaded and most of the guests were gone, I served myself seconds and ate it standing up in the kitchen, which felt like a real “What would Nigella do?” moment. I loved both of these books, and both keep their promises. 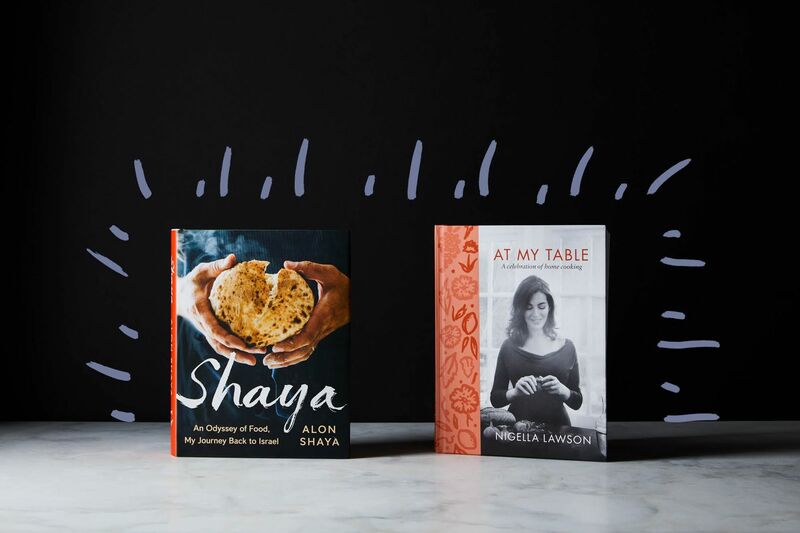 At My Table is full of reliable recipes for weeknight dinners or easy entertaining, and Shaya reads like a recipe-packed memoir by a multifaceted chef drawing together a great many influences—cuisines of Bulgaria, Italy, Israel, and New Orleans (where one of his restaurants is located) among them. Despite my unending love for Nigella, Shaya wins this round. I didn’t necessarily need (or read) all of the autobiographical pages at the beginning of each section of the book, but they didn’t detract from the recipes—none of which failed. Shaya inspired us to go out and get new ingredients to try making things we never have, and it rewarded us for doing so. The page with the spanakopita recipe is already well-loved and oil-spotted, and I doubt it will be the last with that fate. Sounds like an amazing meal! I remember Bulgarian Feta as having a more tangy flavor but I'm sure any would work as a substitute. Would love to hear more about the lamb chops because I have found my preference lately has been to go with my cast iron pan but I'm finding it a learning process. Do you find any tricks to share? I just followed her instructions and heated the pan over high heat before I took the chops out of the marinade (at room temp) and cooked them for about two minutes per side. Loved, loved, loved being walked through the recipe process! The proof of a great cookbook isn't just in the deliciousness of the final pudding, but is very much about what it asks of the cook to get there. Curiously I looked at this round with no real interest in another Nigella book and a real curiosity about Shaya. But I left the review thinking At My Table sounds like an truly useful, delicious addition while I can easily live without Shaya. It's the mark of an excellent review when you can totally understand the reasons for the reviewer's conclusion while being sure of your own, different one. I felt the exact same way! I didn’t think there was any room in my life for another nigella cookbook but this review made me like the book that lost more than the one that won! I was actually holding my breath as I read this. Not sure I can accept Shaya going out in anything less than the final round (and still may not be happy). I might have become one of *those* Piglet readers :) Great review that to purchase At My Table to join my friend on the shelf. I’m a squidge disappointed. I was hoping At My Table would win but enjoyed Jenni’s writing and a look in at her dinner party planning and prep. Another enjoyable review. I like both these books but have only cooked from At My Table. No Middle Eastern market anywhere near me but if I ever make it to the big city maybe I'll check thete. I like the photos and workflow sharing. It really shows the effort put in, and gives the reader the feel of the effort and approach. Though I can do without the ego snark that leads people to change fundamental recipe elements, I do think a little more bite would be great. But ultimately, this is one of the only cookbook reviews I have read that felt practical and not too generalized, over-positive, or overly flippant. Most especially moments of following the directions while missing key information that'd be a benefit (what a certain pepper is, how long something will take, etc). Another really good review, and I, too, like the accompanying photos. But, I'd like to throw something out here- has the Piglet gotten too nice? Believe me, I'm all for kindness in my everyday life, and certainly our politicians could use a mega-dose, but I find myself missing the snark from past years. Where's the reviewer who made an assistant cook the recipes? Where are the reviewers who don't own an oven, or have no desire to shop for ingredients, or who flat out hate one of the cookbooks? Even the people commenting on the these essays has dwindled considerably this year. The people who have intensely disliked the video format have stayed quiet. The Diana Henry fans, who have been so vocal in the past, where are you? That being said, I still love you, Piglet. I will still cook, bake, and purchase a few of these books. However, I just won't be chuckling or shaking my head over outrageous moments like I have in the past. Unless of course, someone goes rogue in the next two days! As a marketer by profession, I would guess the dwindling of people commenting might have to do with Food52's not emphasizing the Piglet contest as much as they used to in their emails. I love the Piglet (including the quirky reviews from past years you mention) and was keeping an eye out for it----but totally missed the starting round because it was "featured" in the fifth section down in a long email with the subject "For better meatloaf, use this "why didn't I think of that?" trick." In past years, Food52 used to send emails headlining the Piglet, with little else in them. They certainly seem to have their marketing game on so I expect they are being guided by detailed stats and doing what generates the most interest and income. I almost missed the first round also and appreciate your reasoned explanation for why the contest has less ballyhoo and controversy. I'm torn between truly appreciating the thoughtful reviews this year and missing the feeling like I'm in a bar arguing with a lot of funny, opinionated friends. Because... e-commerce. Food52 is now about the very handsome, very expensive stuff they sell. OK with me, that's their business (literally). Piglet harks back to a time when the site was more about making food than acquiring housewares. To be fair, it is very expensive to support a site like this which has so much original content and supports a large community, so they do have to sell some stuff. That said, I too feel like they are going a little overboard with click-bait headlines and product promos in email, and it is a shame to shove things their longtime audience loves, like the Piglet, below all that stuff. That is exactly why I had to drop it from my email. I only view it daily when the Piglet is let out of its pen. It's a very good review of cookbooks and fun. Interesting review. Kept me guessing till the end! Well done, Jenni! I especially appreciate the pix of your notes and dishes. Nice touch! I already own both books but have cooked other dishes, so I’m inspired to try those you prepared for your review. Your comments on sourcing ingredients are helpful, too. Tough choice between two fine cookbooks. Thanks for your insights!